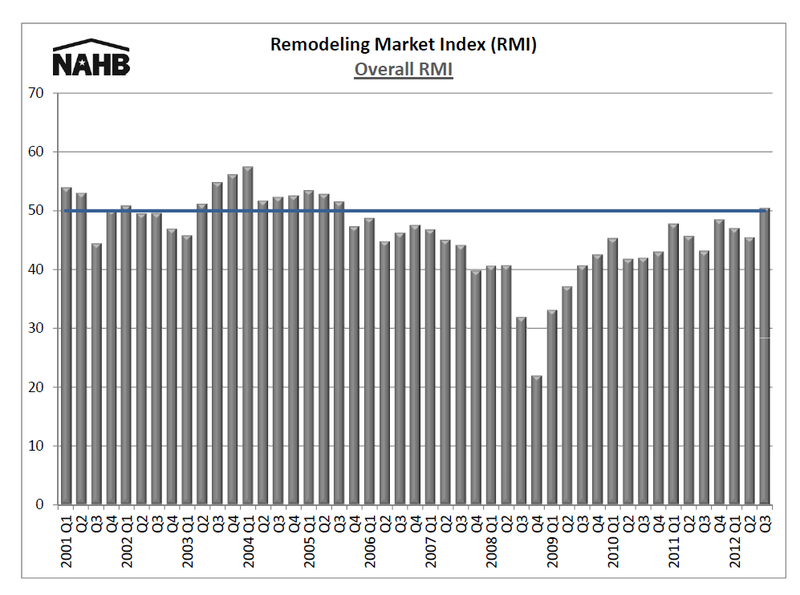 The Remodeling Market Index (RMI) climbed to 50 in the third quarter of 2012, up from 45 in the previous quarter, according to the National Association of Home Builders (NAHB). Released today, the RMI is at its highest point since the third quarter of 2005, tracking the positive trends recently seen in the rest of the housing sector. The RMI component measuring current market conditions rose to 52 from 46 in the previous quarter, while the component measuring future indicators increased to 49 from 44. An RMI above 50 indicates that more remodelers report market activity is higher (compared to the prior quarter) than report it is lower. The overall RMI averages ratings of current remodeling activity with indicators of future activity. All three indicators of current market conditions improved: maintenance and repairs rose to 56 (from 50), minor additions and alterations to 51 (from 47) and major additions and alterations to 49 (from 42). Current market conditions improved or held steady in all four regions in the third quarter of 2012. Current remodeling activity was particularly strong in owner-occupied housing; the sub-components of the current conditions index for owner-occupied housing were all well over 50, ranging between 55 and 60. Future market indicators in every region but the Northeast experienced gains from the previous quarter: Northeast, 38 (from 41); Midwest, 50 (from 46); South, 52 (from 46); and West, 52 (from 42). All indicators of future market conditions rose: calls for bids, 48 (from 44); amount of work committed for next three months, 46 (from 43); backlog of remodeling jobs, 50 (from 46); and appointments for proposals, 51 (from 43). This entry was posted in Business Matters, Home News Feed, National News, Press Release, Remodeler and tagged NAHB, National Association of Home Builders, Professional Remodelers Organization, Remodeling Market Index. Bookmark the permalink.